On January 17, Causa Justa joined with other community-based organizations, including the Urban Peace Movement and California Immigrant Youth Justice Alliance (CIYJA) , to disrupt a meeting of the California Lottery Commission in Sacramento. Why the Lottery Commission? Because the Alameda County Sheriff, Chief Ahern, who serves as the commission’s chair, has refused to meet with us or answer to our demands for transparency and accountability from his department anywhere else. 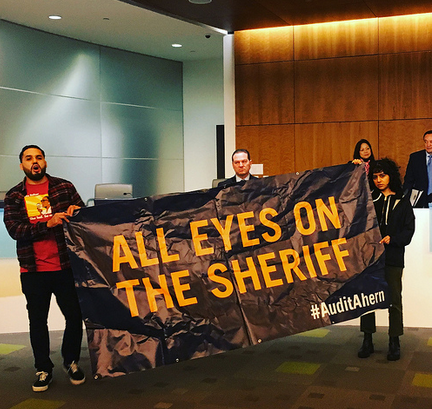 The action, coordinated by the Ella Baker Center for Human Rights, asked that the Lottery Commission remove Sheriff Ahern as chair until he complies with community demands for an audit of the finances and practices of the Alameda County Sheriff’s Department. Rather than being accountable to the people and our visions for Sanctuary and REAL community safety, Sheriff Ahern has shown that he is accountable to an anti-Black and anti-immigrant agenda. Black folks are 11% of the population Alameda County, but they make up 53% of those in our jails. In 2017, Ahern handed over 386 people to ICE and he has continued to publicly post release dates from jail to make it easier for ICE to pick them up. One needs only to look at an organizational culture within his department that breeds open endorsements of racial-profiling, retweets of White Supremacists and the hosting of right-wing militia groups to understand why our communities are under attack. The story of Dujuan Anderson whom the Sheriff’s Department claims died of “accidental asphyxiation”, is a microcosm of the systemic issues happening at Alameda County Jails under Sheriff Ahern. Anderson’s mother, Barbara Doss, confronted Chief Ahern outside the lottery commission after he refused to speak with her indoors. For seven months, Doss has asked for the footage of her son’s death, for an autopsy report, for any explanation as to why the body of her son was returned to her bruised and battered. “I need answers, I need to ease my mind, I need to know what you’re covering up…Santa Rita needs to be shut the hell down, I’m going to get justice for my son. I’m not going to stop. I’m going to be your worst nightmare,” Doss promised the sheriff. Watch more of her testimony here. Support her family in buying a tombstone for Dujuan’s grave here. 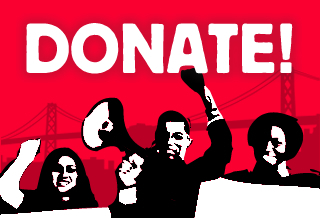 Follow us or @ellabakercenter on facebook for updates on other ways support her family in their quest for answers and for justice. Dujuan is one of 34 people who have died in Sheriff Ahern’s custody since 2013. We demand transparency and accountability around the violent deaths and practices that have occurred under the jurisdiction of the Alameda County Sheriff’s Dept. We need to know how it is that a county that has cut its jail population in half over the last decade has allowed the Sheriff Department’s budget to nearly double to $443m. Call your Alameda County Supervisor today and urge them to conduct an independent audit of the Alameda County Sheriff’s Office.